Ulysses S. Grant is dying of throat cancer. The Civil War general and former U.S. president was robbed by a business partner in a scheme which has plunged him from apparent wealth into heavy debt. Surrounded by family and friends, Grant attempts to write his memoirs in order to provide for his wife, Julia, who comforts him in his final days. His daughter Nellie, victim of a bad marriage, tries to heal the social wounds between an old friend, the Seneca Indian Ely Parker, and the Gilded Age world of Manhattan's elite. They and Grant's son Fred, Generals William Tecumseh Sherman and Frank Herron, the author and publisher Samuel Clemens (Mark Twain), and other family members and old comrades try to buttress Grant's strength, while reacting in various ways to the drama of his dying. Meanwhile, Grant's writing assistant, Adam Badeau, considers his own literary legacy and financial interests. The Last Circle of Ulysses Grant is a spellbinding tale of an American hero trying to win one last battle. Set in the turbulent last quarter of the 19th century, in bustling Manhattan, the Hudson Valley and the Adirondack mountains, the characters deal with issues of politics, race, the Civil War, Reconstruction, religion, love, family, betrayal, friendship, and the life and legacy of Grant himself. Based upon original source materials, the story is an accurate depiction of who and what filled the mind and last days of the man who saved the Union. 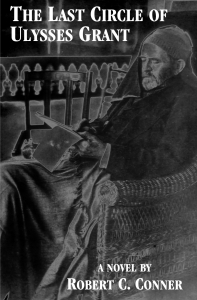 "The Last Circle of Ulysses Grant, uses fictional techniques to tell the story of the General’s struggle to complete his memoirs while in the terminal stages of his battle against cancer. Further, through the judicious use of flashback techniques, the author chronicles the high and low points of Grant’s career, bringing to life for the modern reader the whole era of the Civil War and Reconstruction. Conner, moreover, in poignant and clearly written prose, introduces us to the loving family and former comrades-in-arms who surrounded and comforted Grant during his last days. Civil War buffs and lovers of historical fiction alike will definitely enjoy this fine addition to the literature on a true American hero." "The events of [Grant's] last fourteen and a half months have been well documented, but much of the human pathos of that time can only be guessed at. As only a novelist can, Bob Conner goes beyond the historical record to give us a glimpse into the hearts and minds of the people central to that poignant story ... giving us a new way to understand the last days of one of America’s greatest heroes." "When you walk into the Gettysburg Cyclorama and look up, you are at first startled, then awed. You find yourself literally surrounded by clashing armies. Turn 360 degrees and, wherever your eye drifts, there are men fighting, falling, dying. You are standing in the center of a titanic curved oil painting depicting the Battle of Gettysburg and, though you know what you're seeing isn't real, you're momentarily overwhelmed. As you look more closely, you realize that the amazing panorama is made up of scores of discrete scenes where blue and grey figures are suddenly recognizable as individual human beings; individual human beings doing their best to survive a moment of terror and glory. Bob's book is like that. When you begin reading, you are almost overwhelmed by all the voices. But pretty quickly the noise resolves itself into separate conversations between and among specific individuals. And it becomes apparent that you are within a cyclorama of relationships. This imaginary cyclorama has many layers, many expanding circles. At the center is General Grant. The first circle of personalities surrounding him is composed of family members. The next circle is reserved for his dearest friends. And so on, each successive circle belonging to people less and less intimate with the General who, just the same, were profoundly affected by him. As Grant's life ebbs and he looks back on his successes and failures, those in orbit around him are compelled to review their own histories. Since the Civil War's end twenty years earlier, some have achieved new insights into the war's meaning, into the behavior of peers and loved ones, and into their own hearts. And some just haven't. Within the Gettysburg Cyclorama, you are assaulted by images of violence. Within Bob's book there is no physical action, let alone violence, but there's plenty of mental and emotional turmoil as people reflect upon what was, what might have been, and why. The levels of awareness are various, but everyone senses that the death of General Grant marks, for America and themselves, passage into a new, uncertain era. Bob was once a newspaper reporter and his writing shows it. He is able to make complex ideas and complicated incidents understandable. And he's such a scholar of the Grant years, and the people who inhabited them, that every discussion among the characters in his novel is plausible. Indeed, some exchanges must have happened in real life, just about as Bob describes them. Some of the historical figures in Bob's book will be familiar to you and some won't be. You owe it to yourself to meet, and listen to each and every one of them." This is the first novel by Robert C. Conner, a longtime journalist who won two first-place writing awards from the New York Associated Press Association for newspapers with circulation between 50,000 and 200,000. His previous book, published by Casemate in 2013, was a biography, General Gordon Granger: The Savior of Chickamauga and the Man Behind "Juneteenth." Conner has a Phi Beta Kappa bachelor’s degree from New York University, and an associate’s degree in chemical dependency counseling from Hudson Valley Community College. He serves as a volunteer at Grant Cottage in upstate New York, and as president of the Malta Sunrise Rotary Club. He and his wife Barbara have three grown children. Check out our Facebook page to see photos of recent author events! ©2018, Square Circle Press LLC. All rights reserved. This page last updated 9/6/18.